Sunday PM. Travel Day. Drive to Folkestone (3.5 hours). Kipped at friends house. Monday AM. Ten minutes to tunnel and into France in good time (add hour time change). We found air B&B close to camp and tunnel. A small boat. On the intimate side space-wise. Bought supermarket food for day then drove into camp to a recently built school house (two rooms, no heating). 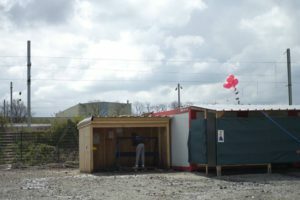 Camp comprised of rows of huts (shed-like), showers, loos, tea room, food area and containers, spaced between train lines and mortorway. We met longer term volunteers gathering children to go on a circus trip organised by mayor. We used the time to set up. Black felt for black-out. Wall as screen. Books as stand for projector. Found translator for posters and put about the camp. We screen Hedgehog in the Fog to a delighted toddler and volunteer. When the group of children arrived and the room was covered in red balloons they went mental. Joyful, grabby! We screen shorts followed by The Red Balloon. One boy, with red balloon, walked into the screen and for a moment his proportions were exactly those of the film and we gasped. 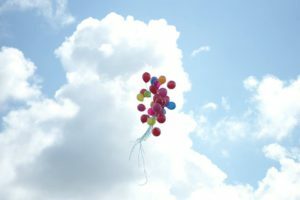 After the film, children took their balloons and cycled them around the bleached out and colourless camp – lighting it up. Especially the girls, who are nearly exclusive in red and pink. We finished in the camp by 7. Tuesday AM. Arrived at 10. 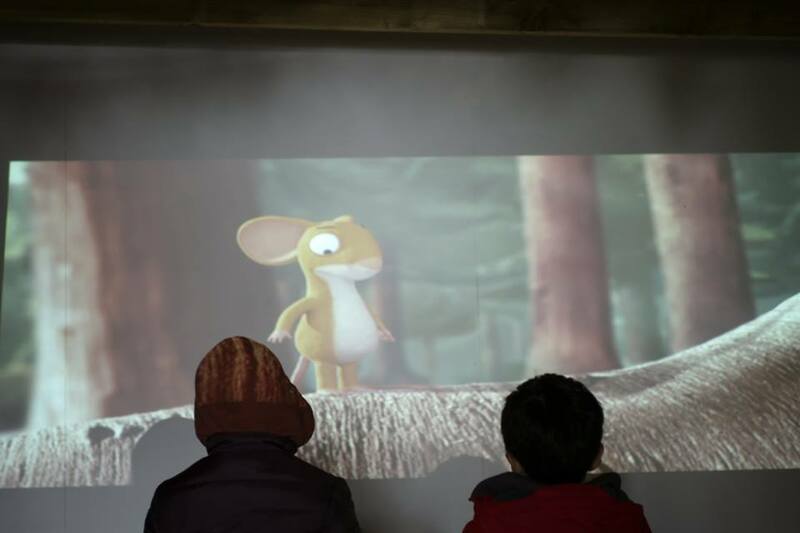 Screened The Gruffalo and The Snowman. And then, for a few minutes, it snowed outside. Children ran out. Caught the flakes in their mouths. An almost hysterical joy. In the chaos the projector fell. Owen fixed quickly and we resumed. After films the children made masks. 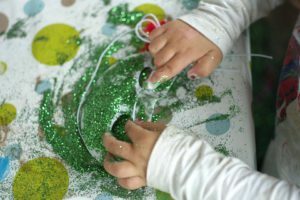 Glitter went down very well and they loved replicating images of masks on the packages – especially pirates. Kids face painted the volunteers. Almost violently. There was a nutty sense of the kids taking control over the offerings. A real wildness. Lunch at 2.30. Back after we showed Sean The Sheep. The children knew the words. Sang along to it and loved the visual storytelling. On request we started Frozen. A volunteer asked for something more ‘male’ and we switched to How to Train your Dragon. But both were a little too wordy in English and didn’t go down so well (next time can we get a Kurdish dubbed one?). Wednesday. Arrive 10.30. A sunnier day and we’re unsure if we’ll get an audience. Started the morning talking with volunteers who said KKP works for them and children. We spoke about leaving projector now or returning with duplicate (but cheaper) kit and showing them how to use it later. They felt that coming back with a projector, speakers and hard drive of films would be best. Request is we return within a month. Kids arrive at 11 and watch with glee Chaplin’s The Circus. Its set in a camp. People make fires to cook. Its full of comedy, spectacle and romance. Meanwhile next door we run a workshop making instruments which are brought into screening . We make noises and music. A mum and her babies join us. After the film kids are taken to a huge bunch of balloons which are let off into the sky. They are not happy. It happens too fast and so KKP blew up any remaining balloons and the kids played with them until lunch time came. We ate with volunteers and camp residents. After which Esther went with three girls to fix a bike, Owen spoke with the bike shack their who are short of personal and puncture repair kits (bikes are great in the camp) as Tom looked after kit and made contact with educational team. We spied a football pitch not much used but elsewhere small groups of young men practising football skills. It was a sunny lunch and some people were cooking outside their huts. As we went back through the camp we now knew many by sight and told them ‘Mr Bean’. Excited kids spread the word. By 3.30 we were back in the school room and had our biggest audience yet. The kids took cushions and chairs and perfectly made their own auditorium. Lots of laughter, clapping and cheering. 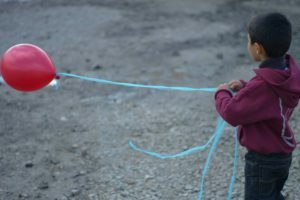 We are told there are 110 children in the camp. We screened to between 20 and 60 at a time. They were not always the same children. Oftentimes it was confusing being in the Dunkirk camp. However, KKP works – facilitating communal screenings and workshops, giving children, families and volunteers some chance of respite,and sharing in laughter and cinematic dreams.